The six-year bull market has not been profitable for all investors, particularly for those who put an equal focus on shorting stocks as they do going long on them. 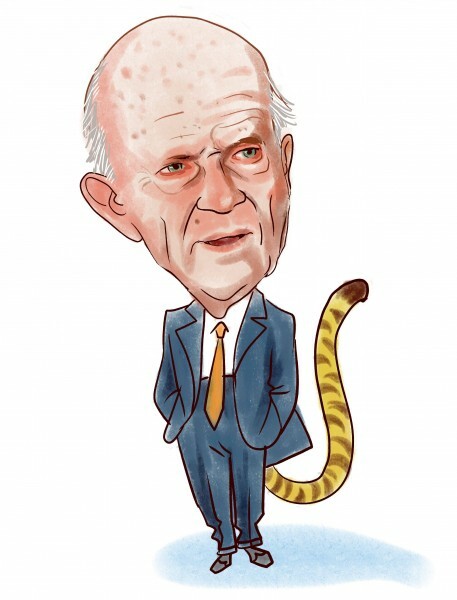 Such is the case with Tigershark Partners, a market-neutral hedge fund co-founded and managed by “Tiger Cub“ Tom Facciola, who co-founded the fund in 2001 with Michael Sears after working at Tiger Management with Julian Robertson (pictured) for one year. Bloomberg reports that according to a person familiar with the matter, the fund will return its $100 million in capital to investors by the end of the month and close its doors. Tigershark Partners will be the second “Tiger Fund” to close its doors in March, as Tiger Consumer Management announced earlier this month that it would also close by the end of March. Unlike Tiger Consumer, whose manager Patrick McCormack cited a personal desire to spend more time with his family as a reason for the fund’s closure, Tigershark’s closure appears to be performance-based. According to Bloomberg, Tigershark Partners averaged a net exposure (long positions minus short positions) of between 12% and 15%, which proved costly during the recent six-year bull market. Unsurprisingly, it has not been kind to funds like Tigershark, with Bloomberg data indicating that market-neutral funds returned an average of just 13% from the end of 2008 through last month, compared to the S&P 500’s 166% gain (including dividends). The market value of Tigershark’s equity portfolio slipped beneath $100 million at the close of 2014, after managing around $300 million during its peak. The closure of the fund perhaps illustrates the flaws inherent in following only one vision when it comes to investing, as opposed to our market-beating small-cap strategy, which pools the top small-cap picks from over 700 hedge funds, cutting through the fallibility of individual investors to find the consensus picks with the greatest potential for growth. That strategy has returned 132% in just the past 30 months, and back-tests dating back 13 years confirm the strategy, on average, outperformed the market by double digits annually. Our research have shown that hedge funds’ top large-cap picks actually underperformed the market by 7 basis points per month on average. Hedge funds have increasingly been allocation a large portion of their portfolios to large-cap stocks which is why most hedge funds failed to generate outsized returns in recent years. Tigershark isn’t an exception. With that in mind, let’s take a look at Tigershark Partners top picks at the end of 2014, following a quarter in which it reduced its exposure to, or outright closed its positions in over half of its holdings. Continuing to lead the way was the fund’s investment in Teva Pharmaceutical Industries Ltd (ADR) (NYSE:TEVA), which has been its top pick for several quarters. Tigershark had a 180,000 share position in Tigershark valued at $10.35 million. The fund’s long position in Teva Pharmaceutical Industries Ltd (ADR) (NYSE:TEVA) proved to be quite lucrative in 2014, as shares rose by more than 44% over the course of the year. Teva proved to be one of the most popular stocks among the wealthiest billionaires we track, with George Soros and nine other billionaires having positions in the company at the end of 2014. Of all funds we track, Point State Capital was the largest investor, with an 8.09 million share position.